A global macro approach combining long-term vision with short-term agility. The employed strategy pursues a top-down investing approach in which the investment process is predicated on movements in underlying economic variable and their potential impact on the financial markets. This approach allows investments to be made and taken advantage of through considering wider global issues that might be present over the longer term, and systematically zooming down to particular segment that might be volatile over the shorter term. Strong absolute returns uncorrelated to market cycles since 1998. Global macro is a hedge fund strategy that aims to profit from large economic and political changes in various countries by taking long and short positions in global equity, bond, commodity and currency markets, both in the underlying cash as well as in the derivatives markets. Global macro strategies generally focus on financial instruments that are broad in scope and move based on systemic risk. Prices in financial markets can be temporarily driven above or below their long-term values and expectations due to unexpected changes of events, such as macroeconomic imbalances, central bank actions, geopolitical risks, trading activities and broad systemic factors. The investment strategy attempts to exploit these temporary deviations from such values and expectations to profit from particular segments that are undervalued or overvalued. Further, global macro strategies focus on liquid assets that usually do not include risks other than market risks such as credit risk or liquidity risks. Many managers use technical analysis along with fundamental factors to drive their investment decisions. The key to success is to employ strong risk reward controls on a portfolio and follow economic and monetary influences that can change the scope of global capital flows. Managers who trade within the context of global macro strategies focus on currency strategies and stock index strategies. The investment approach takes into consideration many factors in a top-down manner, for example, global macroeconomic factors, geopolitical events, central bank policies, interest rate trends, general flow of funds, and other broad systemic factors. In doing so, it is able to repeatedly identify opportunities to profit from interactions between complementary market sectors and take advantage of mispricing through activity in liquid trading markets, thereby providing superior risk-adjusted returns. The approach first requires the construction of a longterm view of the market by studying present global issues that usually takes months to unfold. From this broad view, potential market focuses are then extracted and examined. In this process, investment opportunities are uncovered through the consideration of assets that might be impacted by further development. With the goal of capturing the available investment opportunity, several positions are then established considering the multiple factors affecting one another. Investment positions are generally established through selecting a suitable price level. Managers who place an emphasis on price levels are required to constantly monitor the market movement in order to time the investment correctly. Usually, with the right price levels, profits can be magnified and losses can be reduced. In addition, short-term views are established by remaining close to the shifting sentiments of fast moving markets. Markets typically move because current developments unfold further and new issues to arise. As a prudent investment approach, this process happens continuously and the conclusion of each short-term analysis is taken into consideration with the best investment outcome in mind. In the process of studying the short term, further evaluation is performed to determine the degree of impact towards the long term. In the event that short-term analyses are in line with the long-term view, an investment may be made with the intention of boosting profits. This represents a protected investment since the failure of the respective short-term investment would only lower the profits of the long-term position instead of introducing fresh losses. However, if the development is contradicting the longterm view, the degree of short-term impact will be taken into consideration. Should the degree of impact affect the long-term view, the global situation will be reexamined and factored in the long-term view’s reestablishment. This prudent reassessment allows long-term positions to remain relevant across time. However, if the degree of impact is minimal or short-lived, a hedge position may be taken to reduce risk exposure. Unlike many other traditional investments strategies, this approach is not one that is buy-and-hold. 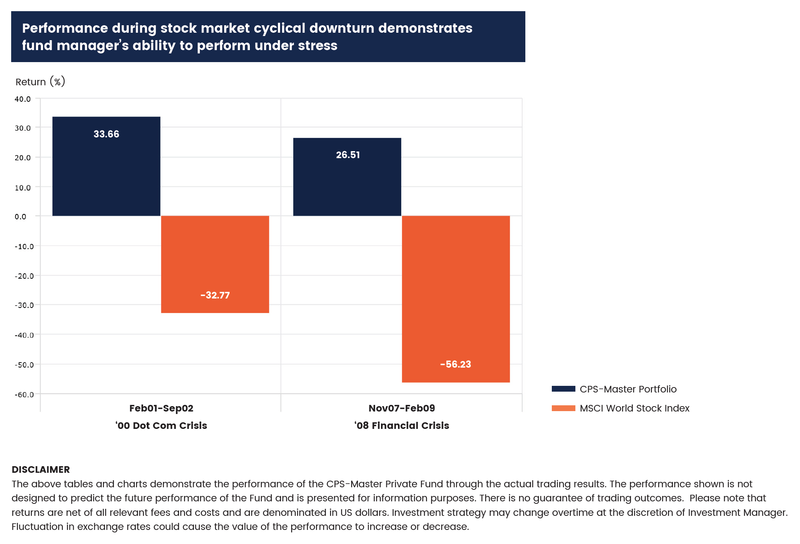 This approach invests in the long-term while factoring in short-term volatilities in order to enhance performance and mitigate risks. It is widely accepted that long-term investments are typically less volatile than short-term ones. Hence because the investment approach starts off by taking a broad long-view, many factors can be taken into consideration simultaneously. Further, with comprehensive understanding of the nature of markets, a cautious approach is employed to remain up-to-date. 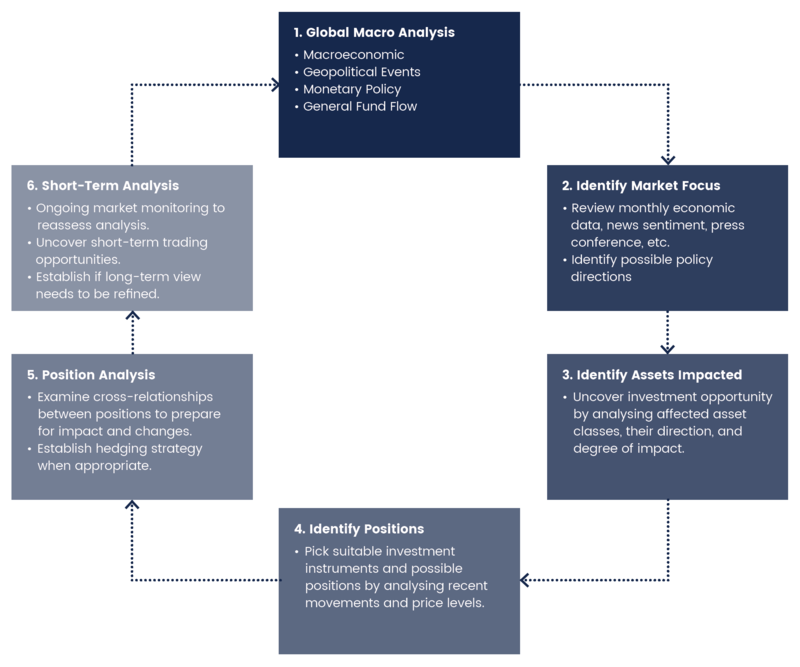 This methodology reaps two benefits – it not only allows more investment opportunities to be taken advantage of, it also acts as a risk management process because it allows the reassessment of long-term positions to determine if they are impacted, and identify if short-term hedge positions are required for risk protection.